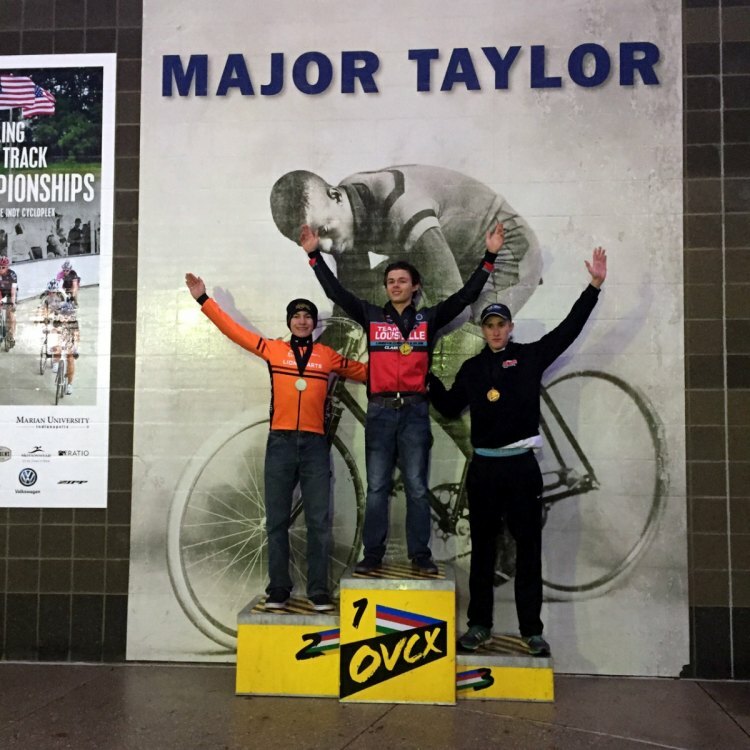 The weather and the top step of the podium, changed on the second day of racing at the 2016 Major Taylor Cross Cup in Indianapolis, Ind. on Sunday. 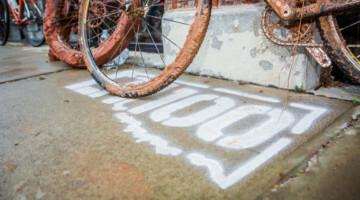 Riders in the Elite C2 events were greeted to a muddy mess on the course at Indy Cycloplex, home of the Home of the Major Taylor Velodrome, which made for different racing styles and outcomes. 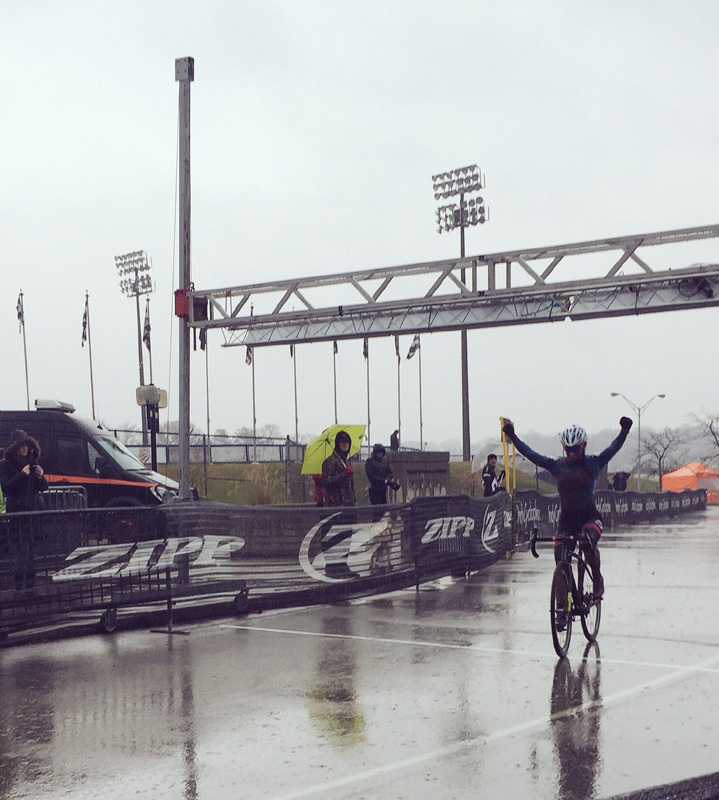 The UCI Elite Women’s race began in a 40-degree drizzle. 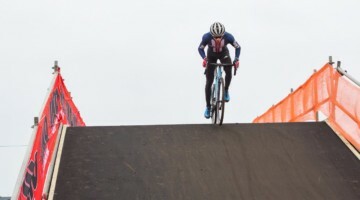 Saturday’s second-place finisher Courtenay McFadden (unattached) of Bellingham, Wash. recovered from an early spill to win her first C2 event for this year’s Pro CX calendar. McFadden only made it halfway around the circuit before going over-the-bars and falling off the pace. She fought long and hard to regain position with the lead group, which consisted of Saturday’s winner Sofia Gomez-Villafane (Tenspeed Hero), Emma Swartz (Trek Factory Racing) and Allison Arensman (J.A. King p/b BRC). 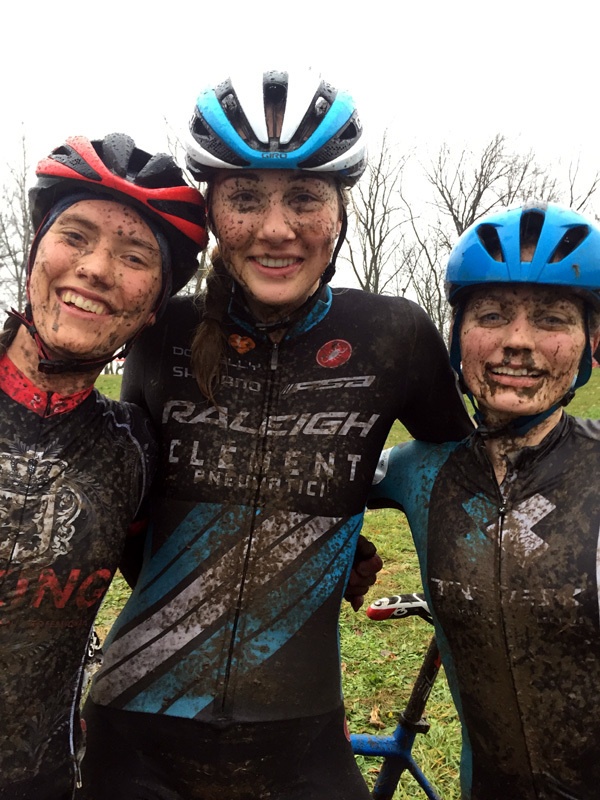 The mud proved difficult for some riders that excelled on the tacky dirt the previous day. Laurel Rathbun (Raleigh-Clement) later joined the group, riding smoothly and confidently as she passed riders in the sloppy conditions. McFadden rejoined the leaders as well, moving her way to the front and eventually creating some separation and putting them behind her. The chase group splintered behind McFadden, as attacks were thrown in attempts to secure the remaining two podium spots. McFadden crossed the line for an uncontested first, followed by Gomez-Villafane 33 seconds back for second. Third place was taken at the line by Laura Winberry (Speedvagon Family Racing), who outsprinted Emma Swartz (Trek Cyclocross Collective). The UCI Elite Men’s race endured worsening conditions, with more rain, lower temperatures and darkening skies. Drew Dillman (Cyclocross Alliance), who finished second by a wheel on Saturday, took the lead on the first lap. Three riders jumped on his wheel, creating a gap between themselves and the field. Spencer Petrov (Cyclocross Alliance) was one of the four men in the group, and rode away from the group for an uncontested win. 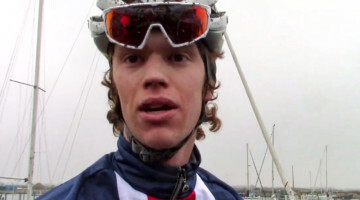 This was Petrov’s first Pro CX win in a C2 event this season. 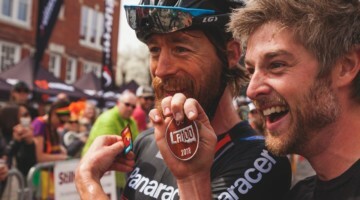 His only other podium finish was a third at North Coast Gran Prix of Cyclocross in Cleveland, Ohio, which was also a cool, muddy day. It was extremely satisfying for him to win in Indianapolis after an early mistake in Saturday’s race. 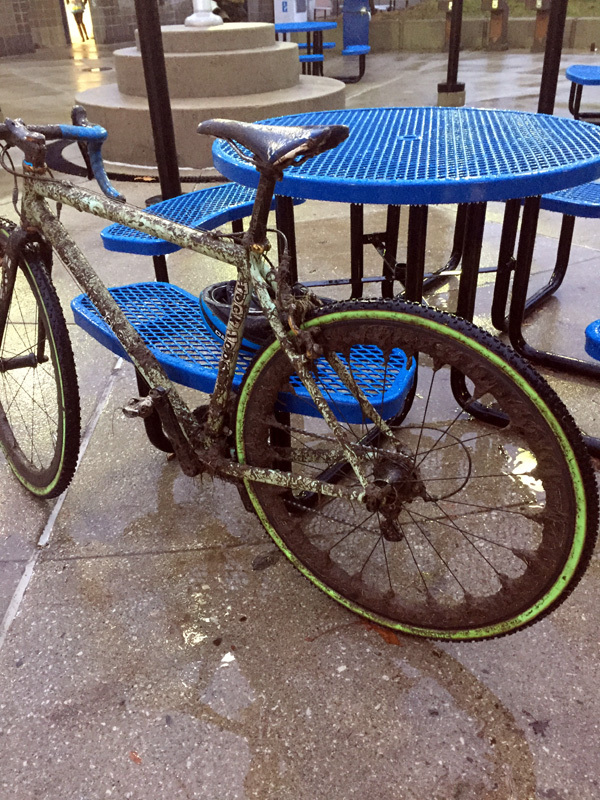 The muddy conditions suited his style of racing. He began the first lap in the Top 10, and made his way to the front. Max Jugelson (Voler/Clif/HRS/Rock Lobster) took second place and Petrov’s Cyclocross Alliance teammate Dillman finished a distant third. The UCI Junior Men’s race was won by Canadian national champion Gunnar Holmgren (Garneau-Easton) for the second day in a row. Holmgren took an advantageous lead halfway through the race and continued gaining ground through the technical sections of the messy course. He finished solo to celebrate his double win. Lane Maher (Hands-On Cycling p/b Giant) followed in second and Brody Sanderson (Hot Tubes Cycling Team) took third. This weekend’s events at Indy Cycloplex were the season finale for the Ohio Valley Cyclocross (OVCX) race series. 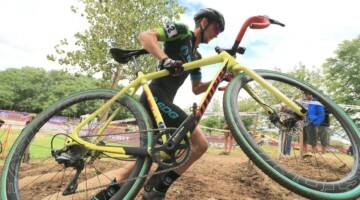 Pro CX races continue next weekend at the Hunter Subaru North Carolina Grand Prix in Hendersonville, N.C. and the Resolution Cross Cup in Garland, Texas.